PICKERING Brook has another attraction that is quickly creating a buzz. Core Cider House boasts beehives, tended by chief beekeeper Neil Tuffin, that are producing honey to rival the best. Mr Tuffin is the brother-in-law of Core Cider House owner John Della Franca, who lives on the property, as did the four generations of Della Francas before him. Mr Tuffin’s hobby is also his passion and last weekend the venue hosted an information session on beekeeping for potential local apiarists. Bees play an important part in the fruit life cycle, with pollination crucial for the production side of the orchard. Core Cider House is on 15ha of land and along with four varieties of pears also grows persimmon, quince, plums, pomegranates, oranges, lemons and seven varieties of apples. The apples include Granny Smith, Pink Lady, Sundowner, Royal Galas, Hi Early and Galaxy. They are spread over 7000 apple trees, which require a healthy bee population for a bumper production to make cider. Mr Tuffin said his man-made hives were very good for bee populations because it enabled them to keep disease out. Mr Tuffin, who is also a member of the WA Apiarist Society, said his love of bees came from their industrious nature and clean approach to life. “They are just so neat and tidy, always cleaning and even leaving the hive to die so other bees do not have to clean up after them,” he said. Mr Tuffin said bees were also great communicators who were able to take signals back to the hives to let others know where the best nectar was. “They literally give the co-ordinates to other bees in the hive and send them off to collect the pollen,” he said. 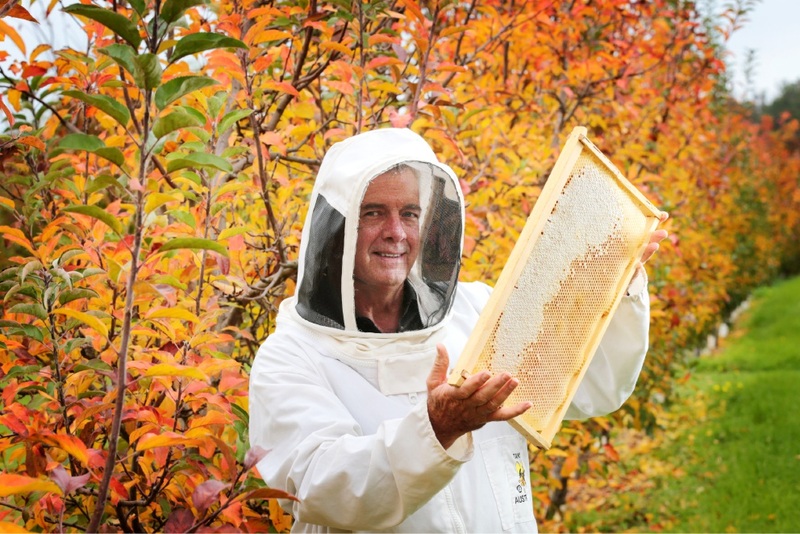 The Pickering Brook beekeeper said he believed in servicing his hives and adding fresh wax for the queen to lay her eggs. “It’s not all about collecting the honey; it’s very important to service the hives and many times its just to keep them healthy,” he said. Most of the hives at the Core Cider House block are three to four storeys high but because there is no pollen at the moment they have been reduced to two-storey hives for autumn. “It’s not unusual to have 50,000 bees in a hive and they live a three-week life cycle,” he said. The industrious nature of bees is well known, with them working seven days a week, but other byproducts of their hard work are less well advertised. “Honey is also known for its healing properties and it creates the perfect barrier against infections and wounds,” Mr Tuffin said. Mr Tuffin said his Pickering Brook honey came close to the manuka honey produced in New Zealand. “Ultimately it is all marketing and this honey which is raw and unprocessed from the local red gum and jarrah forests is just as good,” he said. The restaurant at Core Cider House uses the orchard’s honey in its recipes and the honey, which is raw and unprocessed, can also be bought.